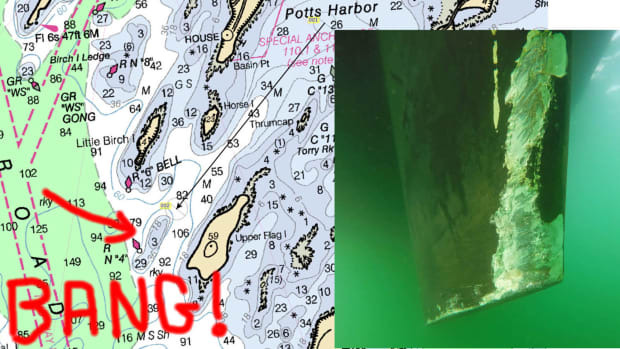 Here&apos;s the Simrad VelocityTrack web page and note that this entry&apos;s illustrations -- which you can click much bigger -- only include a fraction of what&apos;s in the downloadable Information PDF. I&apos;ve started with what seems like a clear explanation of the key ways VelocityTrack (and other Doppler motion highlighting features) can automatically and quickly improve collision avoidance. The technology is a pretty big deal in my opinion. 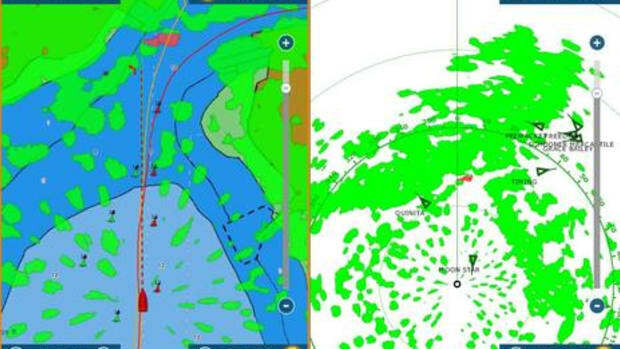 In fact, I judged Doppler target speed discrimination, a "killer feature" when Furuno and Garmin first demoed it in early 2016, and I think that a fair number of boaters -- experienced and inexperienced radar users alike -- have come to agree. But good news travels slowly in our skeptical world, which is why Simrad&apos;s informative marketing approach deserves attention. The matrix also (literally) highlights VelocityTrack differences, most of which are user controls. 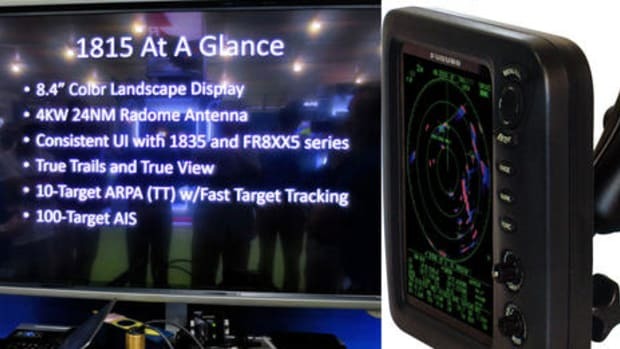 For instance, a Halo radar vessel can choose to only highlight targets moving in its general direction, like Furuno&apos;s Target Analyzer, or to also show targets moving away, like Garmin&apos;s MotionScope. A VelocityTrack user can also adjust the threshold target speed all the way from 1 to 30 knots (a control I&apos;d particularly like to see on the Garmin Fantom 24 radome as its fixed 5-knot minimum misses some targets I&apos;d like to see highlighted). Update 1/6/2018: Furuno USA sent corrections that I added to the Competitor Matrix above. Their NXT radars can use the Target Analyzer feature in dual range mode, though it&apos;s both ranges or none. And Target Analyzer does work with NXT auto switching between 24, 36 and 48 RPMs (though dual range is 24 rpm only). Also, an arguably missing line in the Comparison is the ability to trigger and thus highlight radar SARTS and RACONs, which is generally very hard for solid-state radars with their low transmit power and sometimes unusual frequencies. 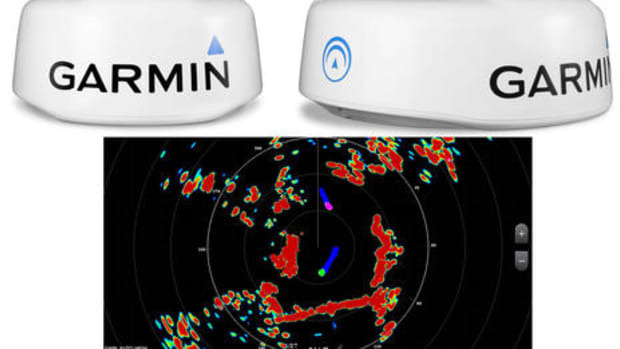 Furuno is claiming NXT SART and RACON detection up to about 1nm while I&apos;m not aware that Garmin or Simrad claim any detection for their solid-state radars. 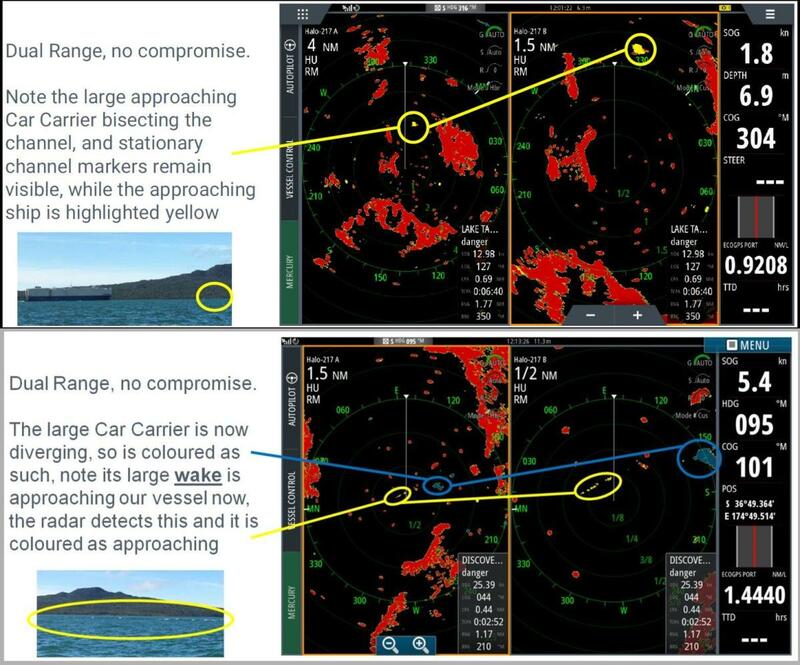 VelocityTrack also works in Halo dual range mode -- true for Garmin Fantom too, but not Furuno NXT -- and this screenshot series from the PDF illustrates how that can look in practice, along with an impressive Doppler trick I&apos;ve seen myself from time to time. As expected, the big car carrier is brightly highlighted in yellow as it approaches, and then more dimly marked after it has passed its CPA (Closest Point of Approach). But since its wake is big enough to be targeted by the Halo radar and still approaching at more than threshold speed, VelocityTrack lights it up yellow - a little added situational awareness that might be darn useful. VelocityTrack seems adept at juggling colors so that the target highlighting stands out in whatever pallete you prefer, even with echo trails or overlaid on charts. Apparently it can also highlight rain cells, and it&apos;s possible to approximate the cell&apos;s speed by adjusting the threshold speed. 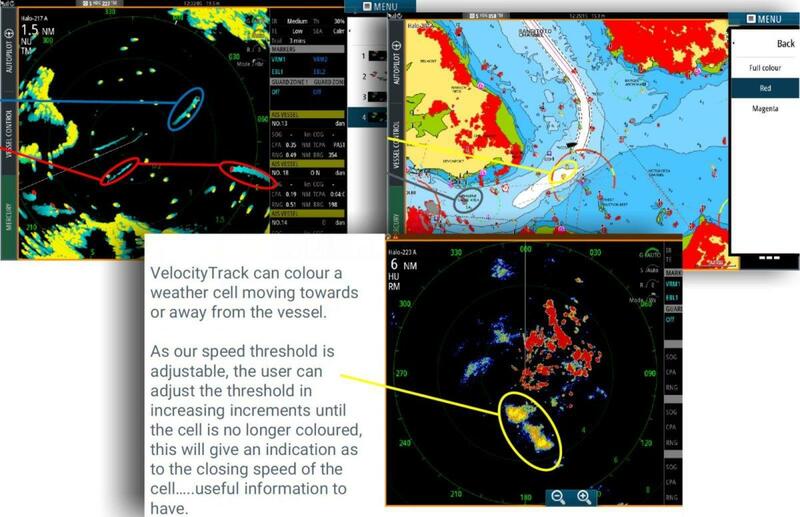 But Simrad isn&apos;t shy about declaring certain limitations of VelocityTrack or possible confusions Doppler motion highlighting can cause. Now I suspect that many readers already understand how the Doppler effect slightly distorts the frequency of a returning radar microwave and that&apos;s how motion can be detected on every sweep. And in my own experience the transitions that often happen seem fairly obvious, though useful. For instance, a crossing vessel like that car carrier above will highlight as approaching, then briefly go to stationary target color -- because for a moment it is neither coming toward you nor moving away -- and will finally highlight as diverging (except on Furuno screens where it remains unhighlighted, though quite possibly ARPA&apos;d, which we&apos;ll get to). 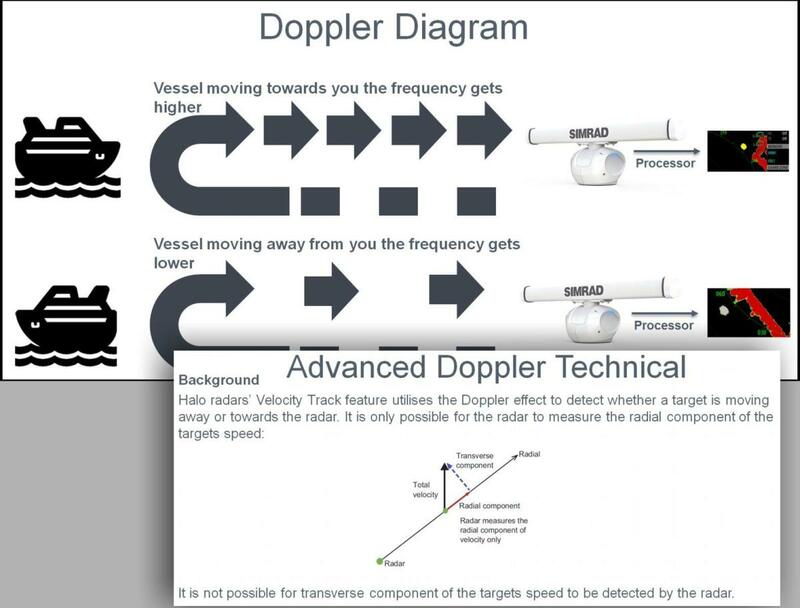 But now, thanks to Simrad, I better understand how the Doppler can only detect the radial component of the target&apos;s motion, not the transverse component of the vector that is its true motion. 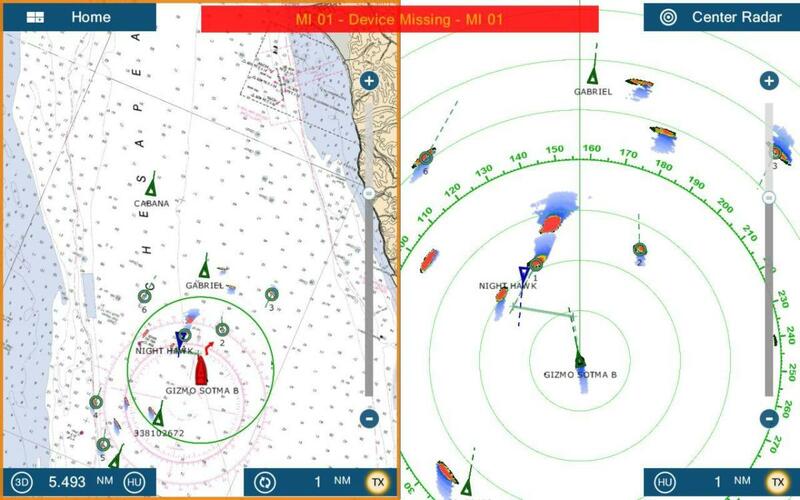 While I still think that most users will intuit what&apos;s going on, Simrad&apos;s detail and diagrams really spell it out. 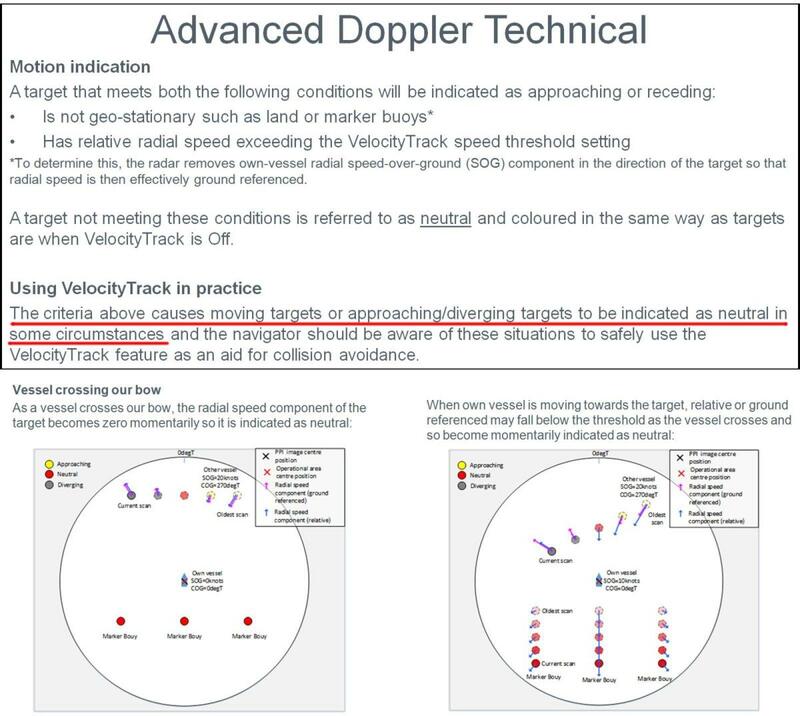 So those diagrams above show what VelocityTrack and similar Doppler highlighting does during crossing situations, and there are more diagrams for other situations in the PDF. 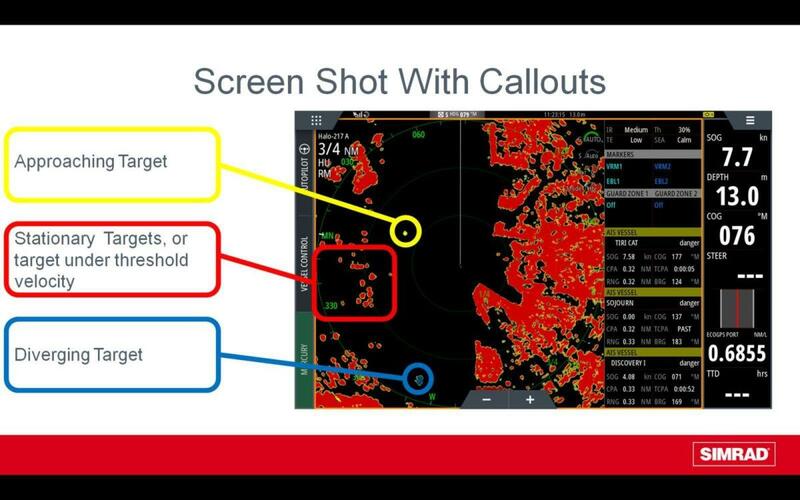 Simrad also details how VelocityTrack and similar Doppler highlighting can get messed up when the target vessel and/or your own are moving at high speed. But, dang, "wagon wheeling" doesn&apos;t happen unless a target is going at least 50 knots and you could be going that fast, too -- see the competitive matrix -- so I don&apos;t see this as much of a real world problem. 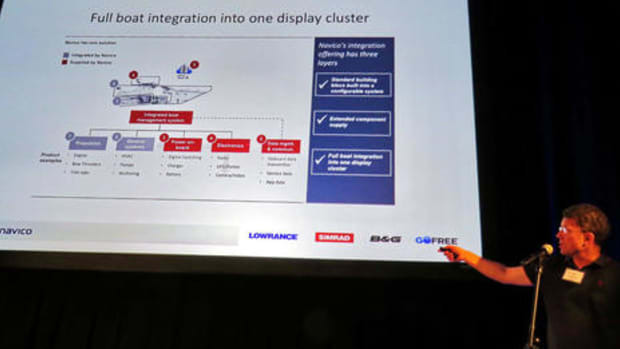 The Simrad presentation PDF also shows how the VelocityTrack controls have been integrated into their NSS/NSO interfaces as well as B&G Zeus, Simrad Commercial, and even the GO9/Vulcan9 entry level MFDs. 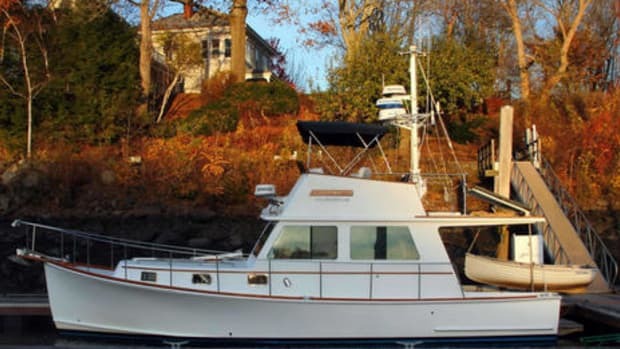 You&apos;ll also find detail about the VelocityTrack unlock procedure, which costs $500and is a first in marine electronics, I think, but likely not the last. Some Halo owners may grumble -- we&apos;ve come to expect new features in free software updates -- but note that the total Halo and unlock price is still quite competitive. In fact, I bet that most Halos get the VelocityTrack feature once more boaters experience the benefits. 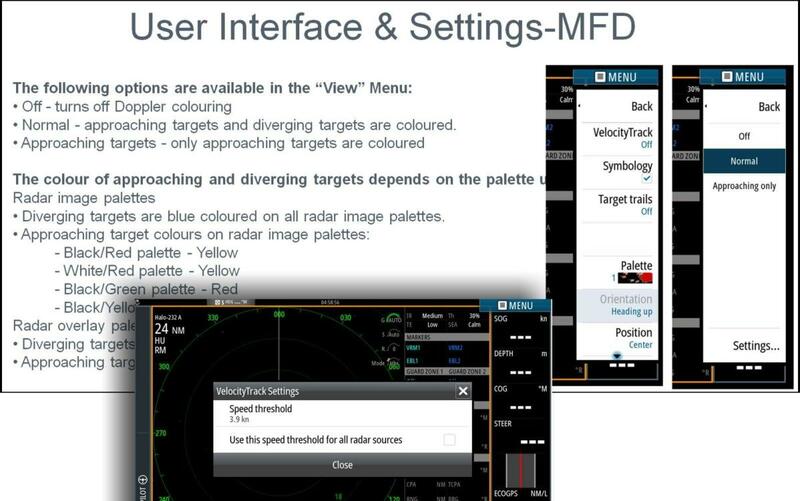 You may have noticed that Furuno&apos;s Target Analyzer looks rather minimal in Simrad&apos;s feature matrix, and that&apos;s true, but kudos to Simrad for including the fact that only Furuno NXT solid-state radars use Doppler to assist with the ARPA features they call Fast Target Tracking and Auto Target Acquire. These are hugely valuable features in my experience, and my experience so far is only with the DRS4D-NXT radome. I&apos;m pretty sure that the new DRS6A-NXT open arrays -- with the finer horizontal beam width resolution always possible with longer antennas -- can automatically acquire moving targets with even greater precision and maybe even faster than the NXT radome, and that&apos;s saying something. I reviewed the DRS4D-NXT more than a year ago and am still awed by its performance, particularly the ARPA (which is so far only available in recreational radars from Furuno). These days, in fact, I only enable Furuno&apos;s Target Analyzer mode in very tight and busy harbors, because Doppler motion highlighting is so fast. But in most situations the NXT&apos;s Doppler-assisted ARPA is quick enough at auto tracking that I turn off motion highlighting in favor of using the true color pallette. 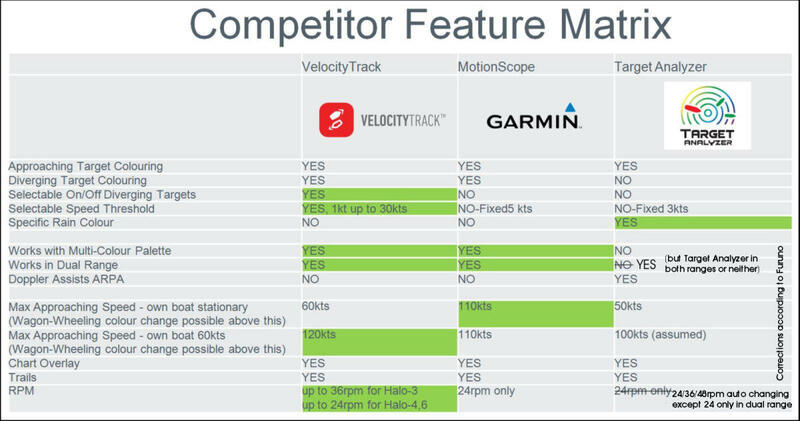 I don&apos;t have to make that choice with the Garmin Fantom 24 I&apos;ve also reviewed, so it&apos;s Doppler MotionScope feature is always on, and that&apos;s likely how I&apos;d use VelocityTrack on a Simrad Halo radar. 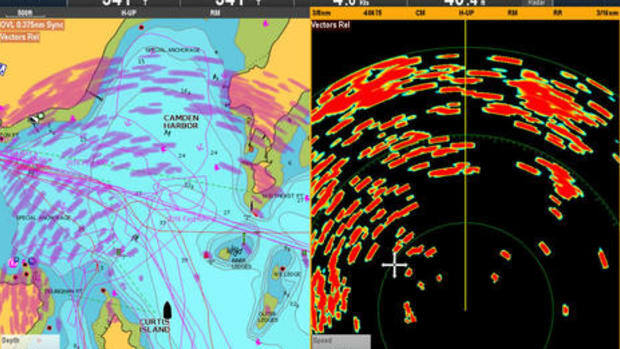 And Simrad is correct that Doppler motion highlighting works very nicely with MARPA, giving you big hints about which targets are worth selecting with your finger or cursor for full tracking. 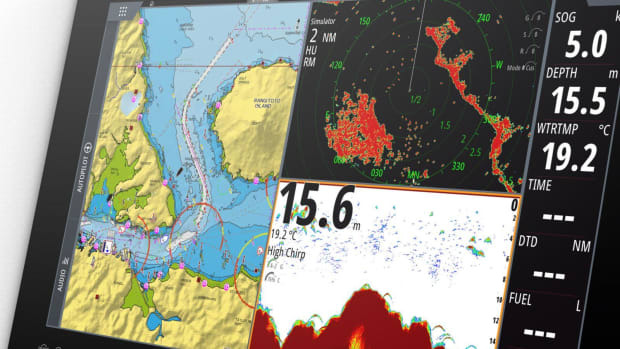 So this Doppler feature is a good thing, and it&apos;s great that Simrad is now offering what looks like a fully developed implementation. But I think that Doppler-assisted ARPA is an even better thing, and here&apos;s hoping that all the solid-state radar manufacturers will eventually pull it off. I&apos;ll close with a Furuno TZT2 screen taken in October as a flock of snowbirds, Gizmo and I included, encountered a tug and barge in Chesapeake Bay. It might have been a stressful scene, particularly in dark or fog, but I was undistracted because every bit of data on that screen was generated without any intervention on my part. And since it was daylight, I can tell you that all those ARPA targets accurately represent the headings and speeds of the boats they&apos;re tracking. Note that the TZT2 can now show true echo trails, which in this case help to explain some targets that the ARPA hadn&apos;t yet tracked, or didn&apos;t think worth tracking, particularly the big barge behind Night Hawk. Note, too, that the TZT2 has neatly diagrammed where Gizmo and Night Hawk will experience CPA assuming we both maintain course. True trails are available on many modern radars, and I&apos;m happy to report that I&apos;m seeing automatic CPA diagrams like that on the Raymarine Axiom MFD with Quantum solid-state radar. 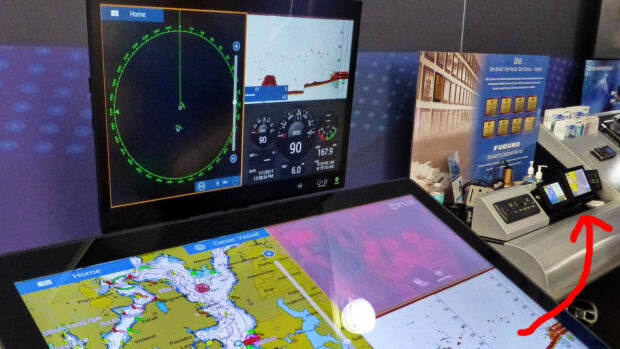 There&apos;s a lot of very good radar and radar display available these days, and in this season of holiday cheer perhaps a tip of the glass to marine electronics is in order?